“Growing up in Fairfax County, I saw the changes firsthand,” says Susan Murdock-Fox, District Commissioner for the Difficult Run Pony Club (DRPC), one of the largest and oldest pony club chapters in the nation. Murdock-Fox joined DRPC as a member in 1968 and her participation with the chapter has continued over the years. Today, she is the parent of two current DRPC members. The United States Pony (USPC) develops leadership and horsemanship skills among young equestrians through a horse-centered, community-minded curriculum. In 1997, USPC identified land loss as a key threat to the mission and well-being of the organization and its members. As a result, Pony Club leaders are now required to educate their chapters about preservation of land and access to land for horses. 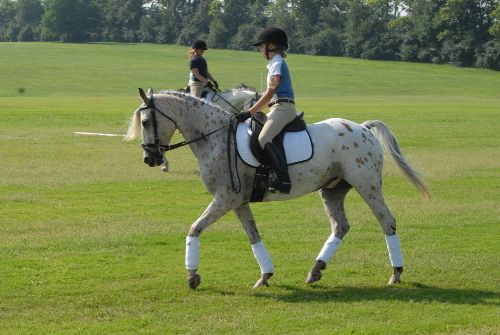 Cameron Rouse has been a member of Difficult Run Pony Club for over four years and has personally experienced the loss of both public and private riding land in northern Virginia. “I think awareness is the most important thing so I would recommend all USPC clubs educate their members and use the educational resources USPC has to offer to help save the sport from losing the necessary land needed for equestrian facilities,” says Rouse. DRPC, which has produced an impressive number of graduates presently competing at the highest levels of eventing, also serves as a model for how local USPC chapters can help their members meet both their volunteer and conservation requirements. Cameron’s experience with DRPC is an excellent example of how local leaders are successfully engaging young equestrians in actively taking part in projects that will preserve our horse lands. Located in Fairfax County, Virginia, a suburb of Washington, DC, the working relationship between DRPC and Frying Pan Park continues to grow stronger despite the threat of rapid development in and around the County. This did not happen by accident. Fairfax County has always taken pride in their equestrian culture. Area equestrians have remained active by supporting local Pony Club chapters, organizing riding clubs, and maintaining public equestrian lands. The Park’s equestrian facilities are heavily dependent upon DRPC’s usage of the facility and on volunteer efforts to safely maintain the 70 plus jump cross country course for schooling and horse trials. DRPC members volunteer an average of 48 hours per year to maintain the 70 plus jump cross country course, far beyond their USPC requirement. DRPC’s commitment to Frying Pan Farm Park does not end with their sweat equity. DRPC also raises funds through two horse trials to pay for the repairs and improvements to the cross country course. These efforts translate into approximately $10,000 of additional support and investment is used to leverage Fairfax County’s investment in the park every year. From pruning trees and branches, to moving jumps, to decorating the course for horse trials, this USPC chapter is a truly dedicated group of young equestrians worthy of recognition. Due to their devoted efforts, Frying Pan Park will remain accessible to equestrian competitors for years to come.